Based on the Dodge Dart's interior volume, the Environmental Protection Agency actually deems this a mid-size sedan—the same class as the Ford Fusion, Honda Accord, Hyundai Sonata, Chevy Malibu, Nissan Altima, and Toyota Camry. But Dodge has priced it to compete with compacts one class smaller, and its exterior dimensions are more in line with that class as well. The net result is a spacious interior with lots of knee room for adults, along with a large trunk. The Dart's exterior styling blends the full-size Charger's aggression with a bit of the friendliness of the old Neon. Although it may sound like a confusing mix, the design works pretty well. The low cowl and wide stance give the compact Dodge a more distinctive look compared to the tamer, taller, slabbier compacts from Toyota and Honda. While the Dart is considered the Dodge Caliber's replacement, as the smallest car sold by the brand, it is more of a descendant of the Neon sedan. 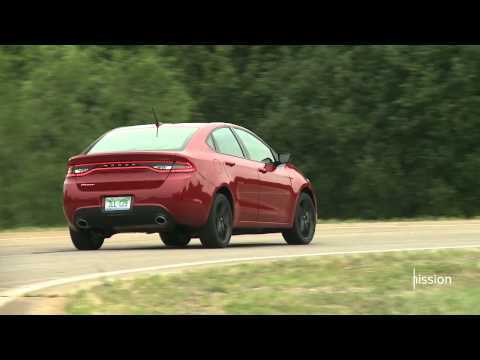 The Dart is a better car than the Caliber hatchback was in almost every way. 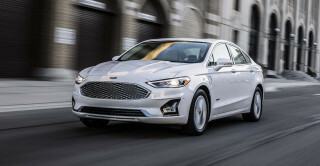 Dart therefore is much better suited to take on rivals in the compact, four-door class such as the Chevrolet Cruze, Ford Focus, the Toyota Corolla and the Honda Civic. 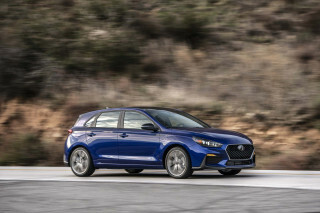 Nissan's Sentra, the Mazda 3, Subaru Impreza and Hyundai's Elantra are also in the fray. It's a crucial, high-volume sector of the automotive market and very competitive. 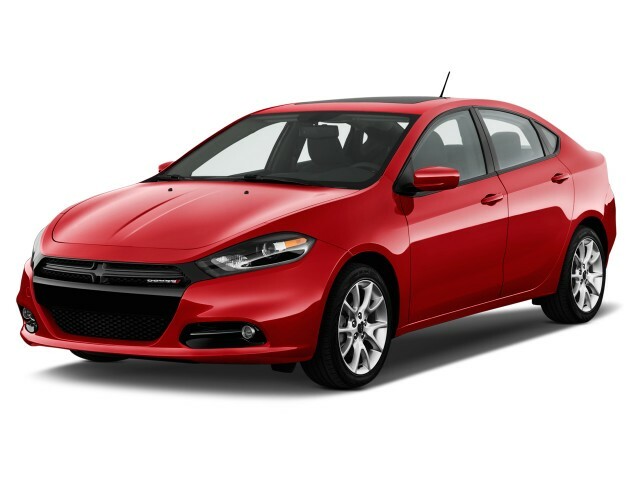 The Dart can be fitted with one of three four-cylinder engines: a 160-horsepower turbocharged 1.4-liter that's out to get the best fuel economy; a 160-hp, 2.0-liter that is the lowest-cost option; and a 184-hp, 2.4-liter fitted with Fiat's MultiAir valve technology that provides the best performance in the Dart GT. All three engines are available with a six-speed manual transmission, while the automatic options vary from engine to engine. 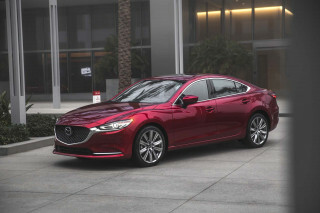 Those in search of the best fuel economy should choose the 1.4-liter engine with the dual-clutch automatic and active grille shutters; it's not the smoothest dual-clutch, slurring its shifts instead of responding crisply like better units. The naturally aspirated engines get conventional automatics, which aren't much smoother. The styling says the Dart is a performance car, but whether it lives up to that expectation depends on your engine choice. The standard 160-hp, 2.0-liter four is simply underpowered in this heavy compact. A 2.0-liter Dart feels significantly slower than competitors in the most demanding duties, like merging into heavy freeway traffic on an uphill ramp while heavily loaded. 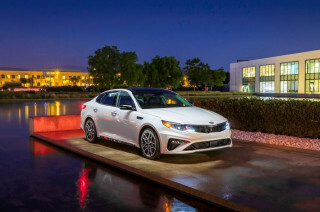 Opt for the turbocharged 160-hp, 1.4-liter engine, however, and you'll find more torque, better acceleration, and a sportier, more responsive drive. But you'll have to keep your foot firmly into the accelerator to make it happen. A special lightweight version of the 1.4-liter Dart, with aerodynamic improvements, is dubbed the Dart Aero, and earns 41 mpg on the highway, according to the EPA, which is the highest figure of the lineup. 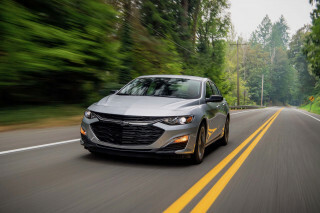 On the other end of the spectrum, the base Dart with a six-speed automatic earns just 34 mpg on the highway, at the lower end of the fuel-economy scale in the compact class. Inside, high-level Dart models feature a 7-inch color thin-film-transistor (TFT) display between the instruments, designed to appear as a part of and blend with the gauge cluster rather than a discrete screen. Other snazzy appearance features include an optional LED ambient lighting system, as well as 14 combinations of colors and fabrics—including one with red stitching on black upholstery. The Dart has achieved top-of-the-class crash performance in testing by the Insurance Institute for Highway Safety (IIHS) and the federal government. Safety equipment includes ten airbags, the usual array of electronic safety control systems, and a few that were new to the compact class when the Dart entered—blind-spot monitoring and rear cross-path detection. It also offers hill-start assist, trailer-sway control (although we don't imagine many buyers pulling a trailer with one), and a rearview camera. The most basic model—which will no doubt be hard to find at dealers—has no air conditioning and even does without power windows. Top-of-the-line Dart models, however, sport Nappa leather upholstery, voice-controlled navigation, and blind-spot monitors, among other amenities. Dodge offers many features bundled in packages, but also leaves many of them as stand-alone options that can be mixed and matched by buyers and delivered as ordered in as little as a month--a real rarity among new vehicles these days. That flexibility offers more than 100,000 possible combinations, which almost guarantees there will be no two Darts alike. There have been few updates to the Dart since it was launched; most changes have affected package content and standard features. For 2015, Dodge offers Blacktop and Rallye appearance packages, and several new colors. The SE model keeps the 2.0-liter engine, while the Aero has the turbocharged engine and the rest use the 2.4-liter. Dodge has been expected to unveil a high-performance SRT version of the Dart at some point, but its existence may depend on sales of the standard-issue model. The Dart has been used in racing, including service as a 600-hp rally car piloted by Travis Pastrana. In 2016, Fiat Chrysler CEO Sergio Marchionne said the Dart would "run its course" for the automaker. It's unclear how much longer Dodge may be producing the Dart, but it's clear that the Dart's days are numbered in its current form.